Meters in San Francisco accept multiple forms of payment. There are two types of meters in San Francisco: the old and new. Old meters do NOT take credit cards, but new meters do. You can pay by inserting your credit card directly into a new meter. 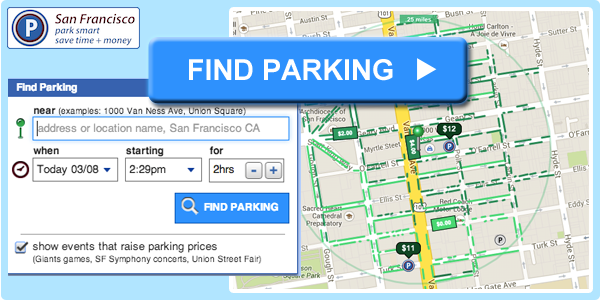 You can purchase SFMTA cards at these locations. 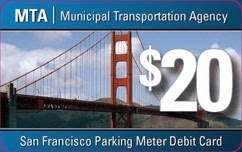 You can buy SFMTA cards online for an extra $2.50 each. Coins including nickels, dimes, quarters, and dollar coins are accepted. You can pay by using the PaybyPhone phone app for iPhone, Android, and Blackberry; or by calling a PaybyPhone's toll free phone number printed on the meter and entering the meter's serial number. Each transaction costs $0.45. PaybyPhone is great for adding money without having to go back to the meter. But remember, each extension costs $0.45.